Hanoi (VNA) – The Vietnamese market on March 1 narrowed the gap between local and global gold prices for the first time since local prices reached their peak in 2010. Since the difference was recorded at its peak to be between 5 million VND and 6 million VND per tael, Vietnamese prices for gold were always higher than global prices. However, the gap was strongly narrowed on March 1 thanks to a rise in the global price of the yellow metal and the stability of local prices. Saigon Jewellery Joint Stock Company on March 1 sold one tael of SJC gold at 33.64 million VND (1,506 USD). At the same time, the global gold trading floor listed one ounce of gold at 1,244.9 USD (also at 33.6 million VND per tael or 1.2 ounces). The stability of the local market had been the result of the Government's effort to put the market under stricter management. In 2012, the Government issued Decree No 24, which states that gold bar trading is only permitted at gold firms and credit institutions licensed by the central bank. The decree was expected to reorganise the disordered gold market, which had been largely manipulated by speculators for years, and introduce a state monopoly in gold bar production and gold material imports and exports. In addition, local gold shops, many of which have stopped trading gold bars as required by the decree, have seen much lower demand for gold bars. Customers now mostly trade in jewellery instead. A representative of Saigon Jewellery Company said they received more sellers of gold than buyers recently, explaining that increased supply and lower demand could not raise the local gold prices. Banking expert Nguyen Tri Hieu told Vietnam News that in the local market the demand for gold was less because people had found other investment channels such as real estate investment, which was looking up, and bank savings, which were enjoying better interest rates. Hieu said the central bank's management of the exchange rate, though it was not a direct factor, was also a good tool to correct gold prices. Hieu said the buying and selling rates for each dollar were listed between 22,350 VND and 22,410 VND, since this year's rates were lower than the ceiling prices last year, adding that the stable rate helped to improve the public trust in the dong. As the result, they won't put their money on dollars or gold. In the global market, according to reuters.com, gold jumped for a second straight session on March 1, bolstered by a safe-haven demand for the metal, after weak Chinese data stoked concerns about the global economy, with the volume of assets in the top bullion fund climbing to its highest level since 2014. 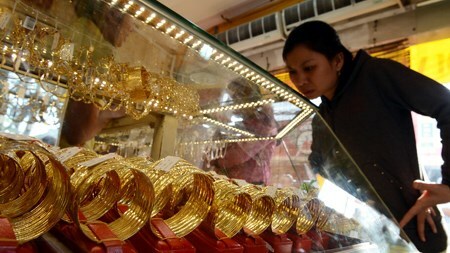 Nguyen Hoang Minh, Deputy Director of the State Bank in the HCM City branch, said while the matching of the local and global gold prices could help reduce gold speculation and gold smuggling, it also would contribute to the stabilisation of the exchange rate and the general macro-economic situation. Duong Anh Vu, Deputy Head of the Analysis Desk in Vietnam Gold Investment and Trading Joint Stock Company (VGB), said it is unlikely for the local gold prices to further reduce. He said lower local gold prices could only happen if the world prices unexpectedly rose, while the people flocked to sell their gold in the local market. However, Vu said it was difficult for the world gold prices to be kept that high if the next meeting of the US Federal Reserve System considered another interest rate hike. On the other hand, many people in Vietnam still considered gold an asset because of its high liquidity despite low demand, he added, saying that it was highly unlikely that Vietnam would see lower gold prices, compared with the world market's level. Local consumer Nguyen Minh Ngoc, 33, said she bought gold instead of selling it as she did not consider the metal as a trading tool, adding, "It is my own savings. I can use it when I want."